Del Frisco’s Grille in Midtown Manhattan has been named the winner of the 2012 Concierge Choice Award for “Casual Dining,” presented by the New York City Association of Hotel Concierges. The restaurant’s General Manager Nick D’Ambrosio and Executive Chef Scott Kroener were on hand at The Loeb Boathouse in Central Park to accept the award on October 1. Del Frisco’s Grille is an exciting new eatery dishing up creative twists on American comfort classics. The menu at Del Frisco’s Grille is a tempting mix that’s easy to share with a crowd – wood oven-baked flatbreads, Cheesesteak Egg Rolls, Ahi Taco’s (my personal favorite), prime steaks, and fresh seafood. It also has an unparalleled and adventurous wine list, surprisingly more extensive than those found in a traditional bar and grill. Their cocktails are unique, and are highly recommended. 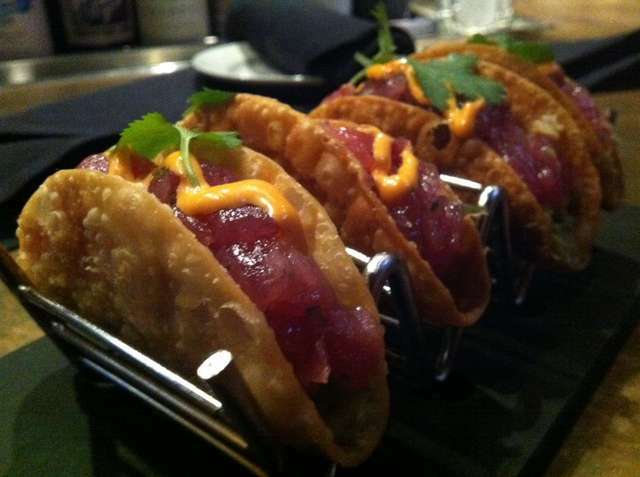 The Ahi-Tuna Tacos…to die for! The Concierge Choice Awards (CCA) recognizes companies, organizations, and individuals who create exceptional experiences for New York City visitors. Established in 2007 and selected by the New York City Association of Hotel Concierges (NYCAHC), these prestigious awards are bestowed upon the city’s elite in the tourist, theater, restaurant, retail, service, and transportation industries. 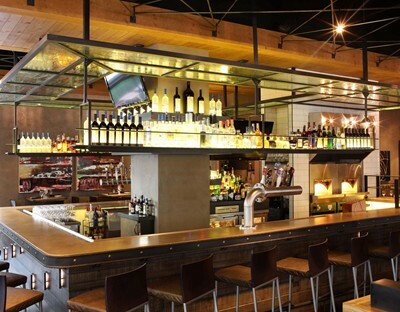 Located center stage in Rockefeller Center, Del Frisco’s Grille opened in August 2011 and is the see-and-be-seen hot spot for savvy Midtown regulars. The Grille is a new concept for the Texas-based restaurant group, also known for its more established award-winning brands, Del Frisco’s Double Eagle Steak House and Sullivan’s Steakhouse. Earlier this year, Del Frisco’s Grille was distinguished with the 2012 Hot Concepts Award, presented for the 18th consecutive year by Nation’s Restaurant News, which recognizes emerging companies showing innovation, bold tactics and tremendous potential for growth. 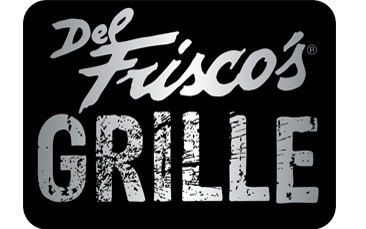 Along with the New York City location, Del Frisco’s Restaurant Group currently owns and operates Del Frisco’s Grilles in Dallas, Washington, D.C., and Phoenix. A fifth Del Frisco’s Grille will open in Atlanta’s upscale Buckhead neighborhood on October 13. Del Frisco’s Grille is one of those NYC restaurants that although it has multiple city locations, it still feels unique and one of a kind. Whether looking for a trendy happy hour with coworkers, a date spot, or a girl’s night out, I would recommend Del Frisco’s Grille! ← If They Like You….